Lobuche West peak lies in the Khumbu Himal Range of the Everest region in Solukhumbu district. Standing tall at 6145 meters, Loubuche west peak is one of the most challenging peaks of the Everest Region. To trek to the Lobuche west, the trekkers required a permit earlier but it has been recently opened by Nepal Mountaineering Association. Lying close to Khumbu Glacier with a panoramic view of Himalayan peaks like the Everest, Nuptse, Lhotse, Makalu, Baruntse, and Ama Dablam, the Lobuche West peak offers an attractive climbing summit. Lobuche west peak is physically as well as technically very challenging so it requires enough alpine mountaineering experience and proper climbing skills. The sharpe ridged and snowy areas of the mountain require the climbers to be roped and use crampons and ice axe. However, teams of experienced high altitude Sherpas assist and guide the group with the climb and a team of porters and low altitude Sherpas work for the arrangement of equipment, tents and food. Starting the journey from Lukla, we follow the Everest base camp trekking trail to reach the Lobuche West peak base and set up a camp for upcoming summit. Due to its geographical position and climatic conditions, climbing to this peak is favored during the months of March to May and September to December. Being physically and technically demanding, the Lobuche West Peak climb is suitable for energetic trekkers seeking extreme adventure and thrilling experiences. All climbers are recommended to partake in preparative fitness and altitude training before attempting this climb. We will take a flight from Kathmandu to Lukla(2840m) and then upon reaching we will trek to Monjo(2835m above sea level). From Monjo we will head to Namche (3440m above sea level). We will spend the day resting and exploring the enchanting valley of Namche. From Namche we will head to Tengboche(3860m above sea level). From Lobuche we will trek to Gorakshep (5140m above sea level). 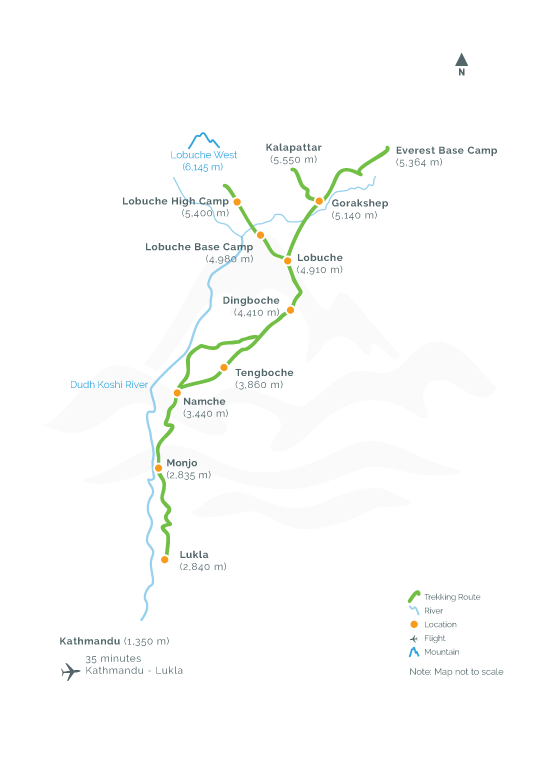 We will visit Kalapathar(5550m) and Everest Basecamp(5364m) and spend the day exploring these places. We will head to Lobuche base camp (4980m) from Gorakshep. The 12th day will be acclimation day at Lobuche Base Camp to help to adapt to the change in environment and get you ready for the following days. From Lobuche base camp we will head to Lobuche high camp(5400m). We will reach the summit of Lobuche West Peak(6145m), our main destination and then head back to Lobuche base camp. From Lobuche base camp we will head back to Namche. From Namche we will head to Phakding. From Phakding we will go back to Lukla. We will take a flight from Lukla to Kathmandu.